The best/easiest way to create different sites per department is by making multiple site collections. 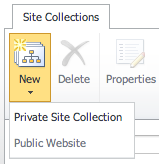 Site collections can help you scale and grow better, and are a great way to group SharePoint sites together. Separate site collections can be created for Sales, Billing, and Support. While sub-sites can be created, administrators experience issues with sub-sites. Each site collection utilizes a separate database. Therefore, if all sites and sub-sites are housed in one site collection, the database size can quickly become too large to operate efficiently. Also, a single site collection can be a permissions nightmare. With multiple site collections, managing permissions can be much easier and less frustrating. Each site collection also has dedicated resources (i.e., Recycle Bin, Usage Reports, Search Settings, Shared Libraries). Distributed administration among the site collections can reduce bottlenecks for site creation and site customization and most of the permissions stay the same if the site collection is per department, resulting in better security settings. The maximum storage a customer can have is 25 terabytes, but the maximum storage allowed per site collection is 100 gigabytes. 1. 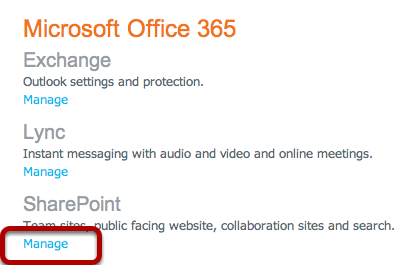 To create different site collections, log into the Office 365 Portal and click Manage under the SharePoint heading. 3. Click New, then Private Site Collection. 4. Next, type in all the desired settings for this new site collection, then click OK. It will take a few minutes to create the new site collection. When it is ready, log in and start building.